Visit FanDuel and start betting! Fan Duel is a partner with STATS LCC and the Fantasy Sports Trade Association which provides real sports statistics. Securely backed by top investors and over one million paying users. Receive check withdrawals within 2-7 days. Instant payouts as soon as league ends. ? All legitimate, real-money Sport Betting sites like FanDuel.com have strict anti-fraud screens, and that may create a short withdrawal delay. Accepting PayPal, Visa, MasterCard, and Discover with money back guarantee. Receive weekly free rolls. Get $200 free bonus when you signup using promo code Insider200. Fantasy sports is enjoying a kind of renaissance in the US right now and FanDuel.com is ensuring that it is at the forefront of this online movement where people are realising that the fantasy sports game is changing, for the better. FanDuel.com is not a fantasy sports site in the conventional sense. You do not pick your team, view the season schedule, buckle yourself in, and prepare for a long hard slog of underachievement and disappointment as you would in the stereotypical long term fantasy football game. This is fantasy sports but with an express attitude. You want it now? You've got it! You want it in-depth? You've got it! Contests are available daily and that means that the action comes thick and fast. However, that does not take away from the quality of the contests. It has been reported that FanDuel.com has spent nearly $80 million of funding on improving its game interface and technology. 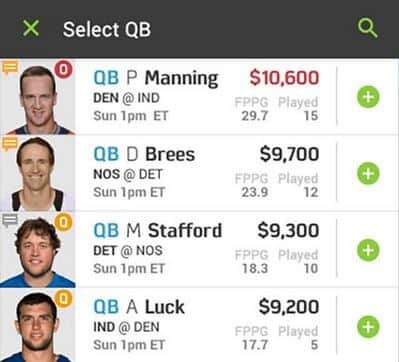 This is a real cash market that FanDuel.com is keen to dominate. The important thing for most fantasy sports players is what sports are available to choose from. In the lobby at FanDuel.com you can immediately see the wealth of sports available to choose from on a daily basis. There are contests based on NFL, NHL, NBA, MLB, CBB, and CFB. You can opt to play an NFL fantasy football contest, national hockey league contest, major league baseball contest or even a basketball contest. You will be bursting at the seams to enter some Fan Duel fantasy football after casting your eye over the options available. The wider selection of contests to play in does not deteriorate the standard and quality of the contests themselves. If you decide to play in a $1 buy-in Monday NHL One Timer contest then you will be given a salary cap of $55k and you will be asked to pick from a selection of players that are in action for their teams that night. Granted, there will be less players to choose from compared to long-term real money fantasy sports games but ultimately the players will still be your picks. You will also get to choose your own FanDuel strategy. The salary cap is your only limitation. 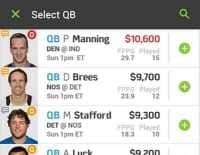 If you have a concern about not being able to afford real time fantasy sports then you can think again. FanDuel.com offers a range of fantasy sports contests on a wide variety of budgets. Entry fees start as small as $1 and even in those contests the winner can win $300. There are also the high stakes contests for the participants with larger budgets. The $5,300 NHL Salary Cap $55k is just one example of the high roller contest where the participants have the chance to win $15,000. FanDuel.com gives you the chance to play on your terms. It is possible to access FanDuel.com on the move. In this age when people barely have time to eat or sleep then it is no surprise that this fantasy sports site has made its content available to a range of mobile devices. There is no need to download an app onto your smartphone. The mobile site caters for a range of mobile devices such as iPad, iPhone, and Android mobile phone and tablet devices. This erases the hassle of having to download apps to access the FanDuel.com content on your cell phone. This FanDuel review is only a guide but it should go a long way to helping you decide if FanDuel.com is the place for you to play fantasy sports. The game interface is one of the slickest around. The navigation isn't as easy as it is with its rival competitors but that is not to say it is bad. The tab at the top of the homepage gives you the chance to view upcoming events, live events, and a history of previous events. The contest search function is also very thorough with the option to search for contests based on their sport, entry fee, and start time. You can also choose which contest type you wish to search for. Contest types available include Leagues, 50-50s, Tournaments, and Head-to-Heads. Yes, that's right, at FanDuel.com you can actually fan duel! Take on a single fellow player mano a mano. May the best participant win! Another important aspect to look at is the bonus and promotions available at FanDuel.com. The site has gained a lot of positive feedback from its Fan Duel promo campaigns including the refer-a-friend promotion, the welcome bonus promotion, the Fan Duel Points promotion, and the weekly freeroll promotions. There is certainly a lot to keep an eye out for. FanDuel.com and DraftKings.com are undoubtedly the market leaders in the online fantasy sports market at the moment. The two companies have endured a relationship that is becoming increasingly bitter over recent months. FanDuel.com even reportedly considered sending a letter to its rival to demand it ceased, what FanDuel.com deemed to be, false marketing in order to gain a competitive advantage. This was a claim that DraftKings.com strenuously denied. As a result, relations are now tight between the two groups and fans of both sites are now even entering into fierce rivalries. 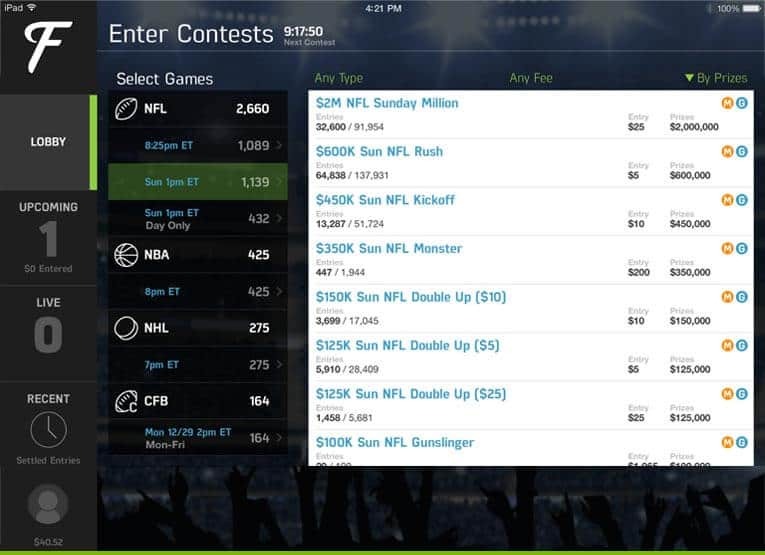 It is widely considered that both are clearly leading the way in the fantasy sports market but the features and navigation on DraftKings just about edges it ahead of FanDuel.com along with more contest types available at DraftKings.com. That said, FanDuel.com is widely popular for a reason. Once participants sign up they tend to stay because the real delights of the site are not immediately noticeable. FanDuel.com might be second favourite to DraftKings.com for the time being but the competition is so close between the two groups that it is far from written in stone that things will remain that way. FanDuel.com certainly has its pros and should not be ignored. Fantasy sports give people the opportunity to pick their own selection of players from a specific sport using a salary cup to compete against teams selected by other people with the team performance based on real-life stats. Participants must choose their own team within the guidelines of the contest's rules and salary cap. The team they have built will then compete against other participant teams. Players accumulate points for the participant's team based on their real-life performance and statistics. Is playing fantasy sports legal? In 2006, the US passed the Unlawful Internet Gambling Enforcement Act which determines fantasy sports betting to be skill-based. However, the law does not cover participants at FanDuel.com that wish to play from the states of Arizona, Iowa, Louisiana, Montana, and Washington. Players can sign up to play at FanDuel.com by clicking on the “Join” button that is accessible via the top right area of the homepage on the website. What site should I choose to play? Your choice of fantasy sports game depends on your requirements. FanDuel.com offers fantasy sports games involving all major league sports including American football, ice hockey, baseball, and basketball. The site also considers a wide range of budgets which is also important when picking your fantasy sports site. FanDuel.com offers participants the chance to play freeroll contests as well as real money contests so the deposit depends on the contest you wish to enter. Entry fees range from free play games all the way up to $10k buy-in games. The entry fee of the fantasy sports game you enter is the only bet you will need to place. Can I win big with a small deposit? FanDuel.com gives participants the chance to play a range of games with low entry fees that allow a large number of participants to enter to offer a guaranteed prize pool. This guaranteed prize pool can be in excess of $20k for entry fees as low as $20. 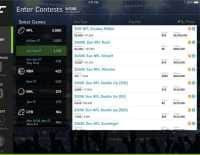 FanDuel.com runs a selection of contests that use real-life performances and statistics to determine the results. Participants involved at FanDuel.com cannot directly influence the results so cheating is not considered possible. Are there any limitations when picking the teams? At FanDuel.com, participants are given a $55,000 salary cap to pick your team. Rules and guidelines for each contest are in place for choosing a team depending on the sports game you opt to play and these rules will alter depending on the sports contest you enter. How do I know what contest to enter? A list of available fantasy sports games are available to view on the FanDuel.com homepage. You can choose to order the games based on contest name, number of entries, entry fee, prize pool, and start time. Is there a strategy to improve my chances of winning? There is no guaranteed method for success in fantasy sports. Fantasy sports is considered to be a game of skill and even though participants develop their own personal strategies to give themselves what they feel are the best chances of winning, what strategy works best is down to the individual and their perception of the statistics. How can I play against friends? There is an option to create a private league at FanDuel.com where you can play a game against your friends. What sports offer the best opportunity to win? The sports that players are familiar with the most offer the players the best opportunity to win. Fantasy sports are based on real life statistics and the knowledge players have of the sports their fantasy sports game is based on will impact on their chances of success. The more familiar a player is with the statistics, the more they can use the statistics to enhance their chances of success. What are the most popular fantasy sports? NBA games are the most popular at FanDuel.com but the popularity of a fantasy sport fluctuates depending on what stage of the season the sport has reached. A sport that has entered the playoff phase is likely to enjoy more popularity than a sport that is still in the regular season. Can I play and practise for free? FanDuel.com gives players the chance to play fantasy sports games for free. This gives players the chance to practise free of charge. What are the different leagues? FanDuel.com offers over 20,000 leagues for players to join covering a range of US sports. What happens if I draft the same team as someone else? It is possible to draft the same team as somebody else at FanDuel.com and, if this occurs, you will finish on the same points and the prize winnings are split between you and the participant you finished on the same amount of points with. Winnings will be entered into your personal account held at FanDuel.com. Do I have to wait before claiming my winnings? The winnings you earn will be accredited to your account at FanDuel.com as soon as the contest you are involved in comes to a close. Do Fantasy Sports operate with the sporting seasons? Fantasy sports operate all year round provided there is a sporting schedule available to set up a fantasy sports contest. Are there any quick wins? Contests at FanDuel.com are available to play on a daily basis with a new sports contest beginning and finishing every day when there is a sports schedule in place so there is the chance to win every day. If I don't do well, how can improve next time? Understanding the statistics relating to the sports contest you bet on can help your chances of success in fantasy sports. FanDuel.com offers a mobile site for players that wish to access the game on mobile and tablet devices. Do I have to know the players well to play? Understanding and knowing players is a bonus that can provide an advantage when playing fantasy sports. However, you are still able to play fantasy sports without an in-depth knowledge of the players. FanDuel.com offers a welcome bonus for new participants and a bonus for players that refer a friend. There are also freeroll tournaments for participants to enter. Participants at FanDuel.com can deposit funds into their account using Paypal or Visa credit cards. Mastercard and American Express can be used via Paypal. Each method of deposit at FanDuel.com is deemed to be safe with no preferred method of deposit favoured over the other. Are there any drawbacks with certain deposit and withdrawal methods? Paypal requests take 48 hours to process. Check withdrawals are also available but take 7-10 days to process. For check amounts over $250 a valid mailing address and social security number are also required in order for the transaction to be processed. Do I need a credit card to play? Due to Paypal being a method of deposit, a credit card is not required to play at FanDuel.com. Games: Fantasy football, basketball, hockey, baseball, and college football and basketball leagues. Join Fanduel.com today and double your deposit up to $1000!